Between 1991 and 1995, Ethiopia had another historical opportunity to (re)constitute itself as a polity. Having used (or abused) that opportunity, on December 8, 1994, the Constitutional Assembly adopted a constitution that came into force in 1995 (see interview here). The controversy around the constitution 21 years after its adoption suggests that the acceptability of the constitution among the various sectors of the society is still a work in progress. A simple content-context-process analysis of this constitution will quickly show the cracks of its legitimacy. Such lack of legitimacy at the moment of ‘(re)founding’ the polity and the deficit in basic consensus about the state-society relationship has a profound impact on the durability and practical utility of the constitution as a frame of governance in the country. Ethiopia has had four major written constitutions in the 20th century alone. (This is without considering the Draft Constitution that was prepared after revising the 1955 constitution on the eve of the 1974 revolution, which overtook the process; and the Transitional charter of 1991 which, being the “supreme law of the land”, served as the interim constitution for the time from 1991-1995. This is also without considering the set of public law legislations that governed the pre-constitutional days of the Derg from 1974 – 1987). The first two written constitutions (the second is supposedly only a revised version of the first) of 1931 and 1955 were both Imperial grants to the (“beloved”) people of Ethiopia. The third, the 1987 PDRE Constitution, was more like a revolutionary manifesto with socialist overtones in its fundamental values and was, at least theoretically, made by the “Working Peoples of Ethiopia.” Ethiopia, being a polity principally formed through military conquest and incorporation of vast lands with populations of diverse linguistic and cultural identities into the Ethiopian empire, the primary source of legitimacy of state power has never been a written constitutional text. It is often said that the key sources of legitimacy in Ethiopia’s past were force (conquest, military expansion), religion (Orthodox Christianity), and tradition (‘right’ genealogy). Both in the 1974 revolution and in the drift made towards a half-hearted liberal constitutionalism in the 1990s, there was a declared intent to break with this past and set the country on a road to the democracy that was to be experienced after the transition. The 1995 constitution (like the Transitional Charter that preceded it) was especially keen on bringing about a rupture, a break from the hitherto dominant mode of organizing the polity as a centralized unitary state that resists plurinationality. It was nothing less than a total restructuring. This is mainly because of the recognition of the ethnic diversity and the valorisation of the same by converting the old oppressed ethnic groups into sub-national sovereignties. The process culminated in the adoption of a written constitution that envisaged the establishment of a federal, secular, human-rights sensitive, democratic republic that is constituted of co-equal ethno-national building blocks. In this piece, I seek to trace the fracture at the moment of founding to explain the deficits in legitimacy. I will then advance the argument that if the state-society relation is to be redeemed and the deficit in legitimacy is to be overcome; Ethiopia needs nothing less than an urgent constitutional transformation (which will in turn help societal transfiguration) into the Ethiopia yet to come. In this first instalment, I will focus on the constitution-making process alone and the basic questions: what does the dynamics that led to the constitution look like? How was the Ethiopian constitution of 1995 made? What kind of legitimacy did it command then, and what kind of legitimacy does it command now? 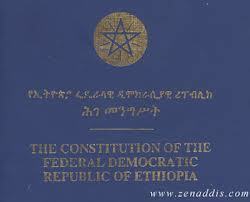 The making of the Ethiopian constitution had its beginnings in the transitional period which lasted from 1991 to 1995. During this period the public life was governed by the Transitional Period Charter, a brief document of no more than 20 articles which served as the interim constitution. The Charter was more like a pact negotiated between ethno-nationalist liberation fronts that, through armed struggle, toppled the regime that was in power until May 1991 and posed themselves as the “peace loving and democratic forces”. As such, it was primarily a peace document, an accord. But it was also more. It aimed at rebuilding the country and restructuring the state democratically. It also sought to mark a break with the past and usher in a new chapter (of respect for human rights, equality, self-determination, and rescue from subjugation, among others) in the history of Ethiopia. The establishment of peace and stability, the ensuring of just peace, the dismantling of the repressive institutions of the preceding regime (alias de-dergification), and the urge to transit to a democratic order were the major goals intended to be achieved through the Charter. The Transitional Charter readily recognized both individual rights and freedoms (under art 1) and group rights (of “nations, nationalities, and peoples”) to self-determination (art 2). After setting the foreign policy principles of the transition (arts 3-4) and acknowledging the right of sub-national entities to directly forge a relation with foreign relief institutions (art 5), it ventured to form a government with a unicameral legislature called “Council of Representatives (COR), (with a maximum of 87 members composed of liberation fronts and other organizations) and an Executive organ (made up of a Council of Ministers and a Head of State acting as a Chairman of the Government) (arts 6-9). Thus a quasi-parliamentary government was set up. More importantly, it envisaged the establishment of a Constitutional Commission (hereinafter the Commission) entrusted with the task of drafting a constitution (arts 10-11). Thus the Commission was to prepare the draft and submit it to the Transitional Council of Representatives, who on adopting it, was to present it to the people for discussion. The final draft that is prepared after such a popular discussion was to be adopted by a constituent assembly to be elected for this very purpose (but in accordance with the provisions of the final draft of the constitution) (art 11). The Charter went on to state that the transitional government will engage in the rebuilding of war-ravaged infrastructure (art 15), according “special consideration to hitherto neglected and forgotten areas” (art 16), and making efforts to dispel inter-ethnic mistrust and hatred (art 17). The Charter also had arrogated supremacy unto itself (art 18) thereby making itself an interim constitution of a sort. The government formed through the Charter oversaw the drafting of the constitution by statutorily forming the constitutional commission in 1992 (through Proc. No. 24/1992). It is interesting to note, incidentally, that the Charter was not strong on the matter of courts, their competence, and their role in managing the ‘constitutional’ equilibrium and that of regional self-governments. It also omitted the issue of charter interpretation. Of course, for a constitutional instrument of a modest objective (of primarily establishing peace and stability and charting out the route the transition is to take), that should not be taken as too big an omission. These two provisions guided and permeated the constitution making process in Ethiopia. One notes that the issue of the composition of the drafting commission was not detailed in the Charter. One also notes the important role the COR is anticipated to play in the deliberation on the constitutional draft, in addition to its role of establishing the Commission, deciding on the commission’s budget, and overseeing its overall activities. In 1992, the Constitutional Commission was legally established. Proclamation no. 24/1992, alias “Constitutional Commission Establishment Proclamation”, was adopted by the COR. Physically placed in the premises of the Institute of Ethiopian Nationalities, as per article 3, (One cannot help but to note that this was also the place where the PDRE Constitution of 1987 was drafted, and speculate on whether there is more continuity than we normally assume), the Commission had the mission of preparing the draft, submitting the same to the COR, presenting the draft as adopted by the COR to the people, incorporating the comments in the final draft as may be deemed necessary, and finally submitting the final draft to the Constituent Assembly (art 4). The tasks (under art 5) included drafting the text, conducting seminars, symposia, and educational discussions (perhaps with a view to creating the ‘festive mood’ that attends to a ‘constitutional moment’), disseminating the draft constitution to the public, gathering comments (especially from the regions and districts), explaining the draft to the public in the course of the discussions, preparing the final draft, submitting periodic reports to the COR, and others. Moreover, the Commission was given the mission to prepare the draft“in conformity with the spirit of the Charter” (art 4). It was obvious that the constitution was meant to be an instrument of advancing the aspirations of those who negotiated the Charter. To that extent, then, it was the extension, or a natural historical outgrowth, of the Transitional Charter. The Commission was organized in such a way that it has a 29-member General Assembly (GA), an Executive Committee, and various other (expert) committees (art 6). The composition of the GA was as follows (as per art 7): 7 members from the COR, 7 members representing various political parties, 3 members from Trade Unions, 2 members each from three professional associations (of Teachers, Lawyers, and Health Professionals – although one wonders why only these three professional associations are singled out for participation in the constitution-drafting process), 3 members from the Ethiopian Chamber of Commerce, and 3 members representing women. (It was also unclear as to how, and from where, these representatives of women were to be selected.) It was not clear if political parties represented in the COR were also to be part of the GA thereby doubling the representation of the dominant party in the COR. The GA was granted the powers and duties vested in the Commission (art 8). So the GA was a proxy for the Commission. The Chairs (both the Chief and the Deputy) and the Secretary of the GA were to be appointed by the COR, and, indeed, were so appointed. In the course of producing the draft, the Commission also consulted a large number of foreign and local experts. In an attempt to benefit from comparison, other countries’ constitutions were also referred to. Concept papers that outline various alternatives (of principles, institutions, and systems of government) were prepared and disseminated to the public for discussion. Nevertheless, Meaza concludes, “this should not give the impression that the process was fully participatory. Those who were not sympathetic to the transitional government and were dismissive of the whole process did not take part in the consultation; they believed that participation would be “legitimizing” the process. Another group, which was not politically active, was not interested.” Meaza is not clear as to which (“other”) group was uninterested. The point stands, however, that the process was not inclusive and fully participatory. Paul, however, observes that “in view of the constitution’s content, it seems regrettable that the processes for making it were so flawed”. It is interesting to note, as shall be argued later, that the content of the constitution – in spite of the “flaws” associated with the making – is what warrants the project of redemptive constitutional practice that may, if successful, lead to the needed transfiguration. The draft was subsequently presented to the COR in 1994, and there the first phase, the phase of drafting, was completed. At the COR, there was a lengthy discussion on every provision of the draft for almost a month. Most of the sessions of the discussion and the (at times spirited debates) were nationally televised. The discussion was informative in many ways. It had a pedagogical import for as long as it lasted. After the draft was deliberated upon and was eventually adopted by a majority vote in the COR, it was presented by the Commission to the public. Thus, discussions were staged in theKebeles. The third phase, the phase of adoption of the draft constitution (as enriched by comments from the COR and the people, much less by the latter), started immediately upon the election of the members of the Constituent Assembly. The discussion in the Constituent Assembly was also lengthy. The discussions ended with the adoption of the final draft submitted by the Commission to the Constituent Assembly apparently after incorporating the comments in December 1994. With it ended the third phase and the formal process of constitution-making in Ethiopia. One can take the adoption by the Constituent Assembly as a form of ratification of the constitution by the people albeit only indirectly through their representatives. Consequently, unlike it is the case in other systems, there wasn’t a popular ratification of the constitution through referendum. It is often argued that ratification through popular referendum would have bolstered the degree of popular support the constitution commands. But given the general lack of the festive mood attendant to constitutional moments, and the fact that the process was rather speedy, as Markakis observed, one wonders if the referendum, apart from allowing one more opportunity for participation, could result in a different content. The answer to the ‘who’ question requires a substantive research into the identity, the political affiliation, and the educational orientation, among others, of the members that constituted the GA of the Commission, the COR, and the Constituent Assembly. Having observed the fact that the nomination and appointment process of those assigned to work as members of the Drafting Commission wasn’t transparent, further considering the fact that the election to the Constituent Assembly (which was internationally declared to be “neither free nor fair”) was an exclusively EPRDF affair (save for some affiliates), one can conjecture as to the political-party composition of the COR and the Constituent Assembly. Thus, it is safe to assert that the EPRDF was a dominant partner in both institutions, and so in the entire process. Designing a legitimate constitution requires a conducive political climate. Ours was a constitution-making process without a real constitutional moment. The epiphany needed to constitute oneself as a polity was conspicuously absent. The lack of inclusion of all the relevant political actors almost at all of the relevant stages, the lack of transparency of the mode of appointment to the Drafting Commission, the lack of free and fair election to the Constituent Assembly (that ended up reproducing the EPRDF dominated COR), the non-involvement of the public in a form of ‘ratification’ (through a referendum or otherwise) marred the process to a great extent. This flaw in the process – coupled with disaffection in relation to the content and disregard of some important socio-cultural, economic and political contexts of the constitution – gave the constitution an unceremonious birth in a polity that was yet to be (re-)constituted into becoming a democracy whose state-society relation was fundamentally transfigured. In part two of this series I will reflect more on this and on the need for an urgent work of constitutional redemption and societal transfiguration. Ed’s Note: Tsegaye R Ararssa, is a Melbourne-based Legal scholar. He can be reached at: tsegayer@gmail.com; or ararssat@unimelb.edu.au.